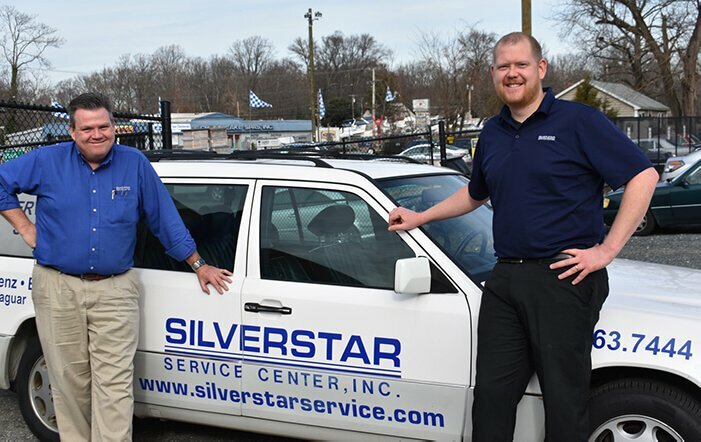 Welcome to Silver Star Service Center, Inc.! We specialize in the repair and maintenance of Mercedes-Benz, BMW, Saab, and Jaguar vehicles. Our second generation family owned business has been serving the Annapolis area for over 30 years! In addition to creating a personal and friendly atmosphere, we do our best to accommodate your needs. Please look over our convenience services and don’t hesitate to ask if you have a special need. Silver Star can perform all your car service and repair, review our maintenance services and ask about any specifics you need help with. Our specialty services will help keep your vehicle in showroom condition with an eye to detail. Our mission is to offer you the best service at a fair competitive price, with integrity and honesty. OUTSTANDING service and Great VALUE in a casual, customer-centric atmosphere. The men at Silver Star are the best! Seriously exceeded all my expectations and made sure I was taken good care of. Very honest, very personable. Walt, you’re the bomb! I just wanted to say Thank You and Great Job to the guys at Silver Star! They have worked on numerous of my cars including my GL 350. They know their stuff and I trust them to get the job done right and much more reasonable then the dealership. Joseph Hall, the service manager, treates everyone right and really know his cars! These guys have kept me safe and on the road for years now! Plus they know how to take care of their customers, thank you Silver Star crew! My husband and I recently purchased two “new to us” Saab’s and we brought them both in for service. Joseph and the team were extremely helpful and gave both cars a full review so we know what service to prioritize. They are able to get parts very quickly and provided a shuttle ride for my husband. Terrific service, fair prices, and quick turnaround. We are new permanent customers! Great service, parts department was thorough and helpful. Patient and explained things vs. rude and rushed to get you off the phone like most other service centers. These guys are attentive, thorough, and efficient. Best car service experience! Every employee is accommodating and actually cares about you and your car. Good people. From what I understand, this is a family-run business. Maybe explains why their service is so important to them. At any rate, this is a business I support and will continue to use. These guys are awesome! After being told that my car would NOT be serviced due to not having 100k miles, I called Silver Star and made an appt. Once I arrived I knew that my car would be in great hands! From the greeting, to the breakdown, even when I picked her up… I was informed of each step by Joe. They even washed and vacuumed my car! I’ll definitely be returning here for service on my BMW. Excellent response time and very personable staff. Excellent response time and very personable staff. First time taking my vehicle to this shop – definitely will be a return customer. Would’ve given a 4.5 rating if available. It is hard to find right mechanic for cars. I do like these guys, they know what they doing and no pressure on suggestion, which gives me power of ownership. I used go dealership and paying lot more for services, and now feel much saving with same services. They are my mechanic for my cars!!! Silver Star is a great shop! I own BMW M3 and SL55 AMG and trust me I took my time to find great and honest mechanic shop! Silver Star is a great shop! These guys rock! They really know my car and its quirks and keep me informed about what it needs and how to get it done. Outstanding service as always from Joseph and his team. New Customer. 2005 Saab 9-3 Transmission Service. Price was less than quoted. Very nice, spacious waiting area. Did not have appointment but they squeezed me in. Very professional service writers. great service great people , great prices –always !!!!!!!!!!!!!!!!! Great service again. From the free shuttle to the professional front desk guy. Very honest, trustworthy and professional. Explains work that has been completed and gifts an accurate price. I don’t bring my cars just to any shop, I really trust the people they work at Silver Star and they are fast repairing my car and have the car ready for pickup! Thank you guys! Joseph and team are the essence of outstanding customer support ensuring complete satisfaction with every service appointment. Awesome staff and great service. Awesome staff and great service. They have accommodated me and my last minute requests. Joseph did a great job explaining to me the process to acquire a new key and allayed all my concerns. Joseph did a great job explaining to me the process to acquire a new key and allayed all my concerns. He also did a great job on advising me on how to remove all the door dings on my 540 and the car now looks like it just rolled off the showroom floor. Overall, I am very satisfied with Silver Star’s service and would highly recommend them to anyone. The service was prompt, reasonable, and friendly. I was a call on for an 18 year old XK8 with a balky top. The service guys fit me in promptly and as promised made the top work like new. The service was prompt, reasonable, and friendly. I since went back for another item that was handled in the same manner. John Y.
I come from two states away. The best, on time and detailed, expert analysis, reliable and better than factory results. I come from two states away. Exceptional in all aspects. Great communications. Never any surprises. I have been a customer for over fifteen years. They have maintained two Mercedes and one Jaguar for me. I highly recommend this group. I have been going to Silver Star for years and they are so trustworthy, knowledgeable and have excellent customer service…the BEST!!! It is a blessing to deal with very honest people who really care about their customers!!! A huge thank you!!! Excellent service and staff! Very friendly folks and even have an associated license facility on the property. They performed all service on time, within their estimates and even provide pick up and drop off service if your vehicle will be in their shop for an extended period. I highly recommend Silver Star Service Center. It’s always a pleasure to hand the keys over to Silver Star.